In a household with a Celiac, Corn tortillas are a staple. 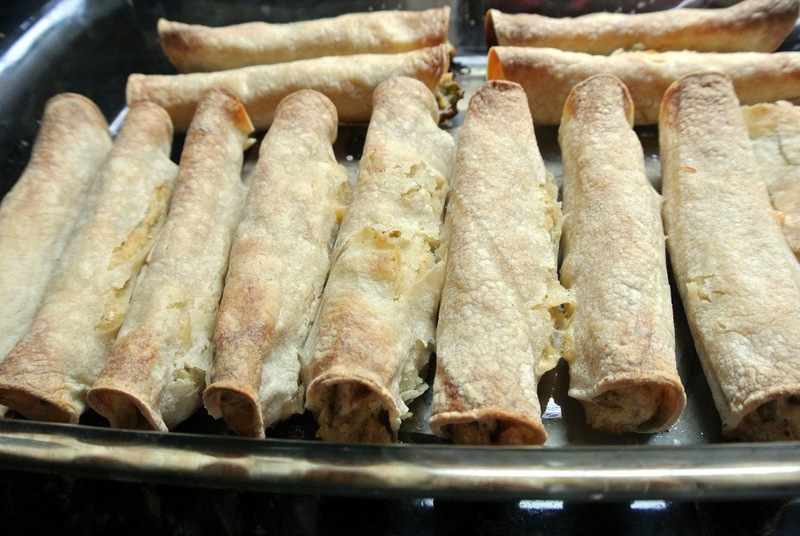 Taquitos are one of my favorite things to make because you can make them so many ways. This is my play on spinach artichoke dip with chicken, wrapped up in a meal. 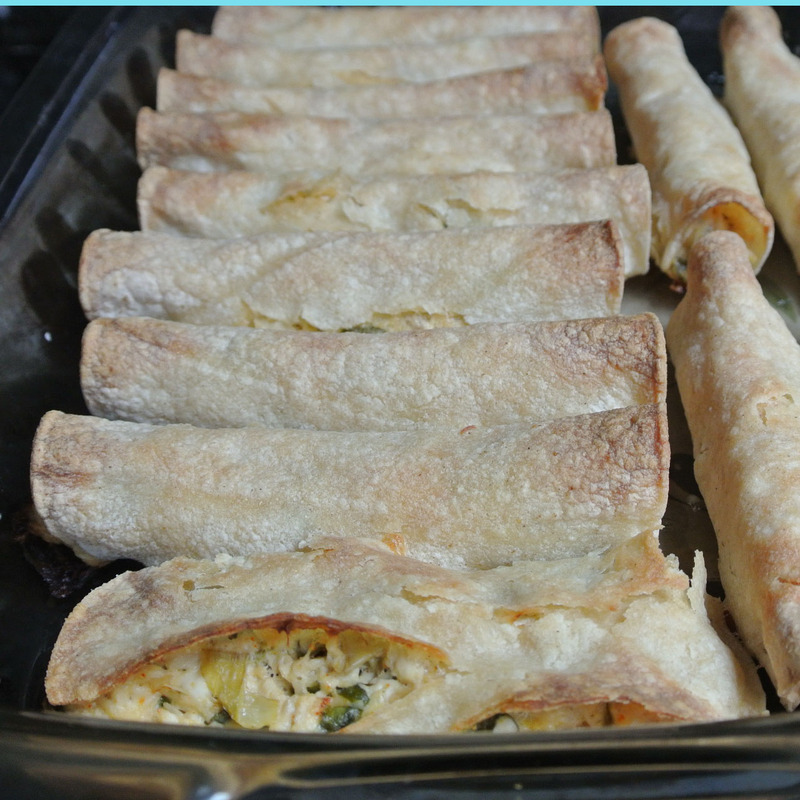 My family loves spinach artichoke dip, so it just made sense to me that they would taste good as a taquito. These would be amazing even without the chicken, but I was going for extra protein. Great as an appetizer or the main event. Enjoy! 1/3 C sour cream -or- greek yogurt. Heat a large skillet over medium high heat. Once hot add 1 TBSP olive oil. Salt and pepper both sides of chicken breasts and add it to the skillet. Brown on each side. Note that it will not cook through, you are just searing the meat on each side to hold in flavor and keep it juicy. In a large stockpot, add browned chicken, and broth. Bring to a boil, and boil until chicken is easy to pull apart with a fork. About 30 minutes. Using two forks, shred the chicken in the broth. In a large bowl Add cream cheese, sour cream or Greek yogurt, mayonnaise, chopped spinach, artichoke hearts, salt, chili powder, and cheeses. Stir until thoroughly blended. Add shredded chicken and stir well. Now you have options for how to soften the corn tortillas. If you have a tortilla warmer, you can use that in the microwave place 6 tortillas at a time, cover and cook for 45 seconds. 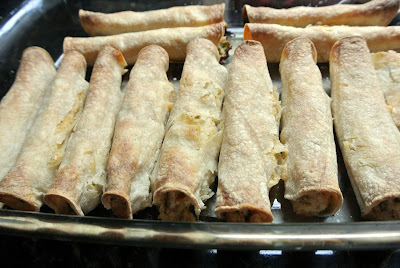 Or you can wrap the tortillas, 6 at a time in paper towels and warm in the microwave for 45 seconds. Or if you are not counting calories you can add some canola oil to a skillet and warm over medium heat. Add corn tortilla and heat on each side for 10 seconds. Repeat this process one at a time. Now fill each tortilla with about 2 TBSP of the chicken mixture. Roll up and place in a large rectangular baking dish. Bake in the oven for 30 minutes or until crispy and golden brown. yum! I love this recipe-the addition of artichokes makes it sound amazingggg! It sounds so delicious! Lovely recipe. These look good! I like that you can slim them down a bit with the greek yogurt (my favorite swap-out ingredient). And that they're baked? Excellent.